ANOKA, Minnesota – Federal Ammunition is proud to announce a new special-edition line of American Eagle handgun ammunition. A portion of the proceeds from every box sold goes to Concerns Of Police Survivors (C.O.P.S.) and its mission to support the families of fallen officers. The product is specially packaged and available for a limited time only. 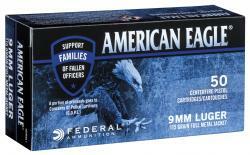 Like all American Eagle handgun ammunition, these loads’ high-quality brass, consistent primers and accurate FMJ bullets make them ideal for the range, and they provide ballistics and recoil similar to equivalent duty rounds for the most realistic training possible.